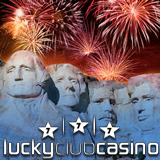 It's American Independence Day this weekend and Lucky Club Casino is celebrating with a month of freeroll slots tournaments and weekly staggered casino bonuses up to $300. Very few online casinos offer the unique games provided by Nuworks. Metro-style Lucky Club Casino is one of the few chosen casinos to offer games like Crystal Ball, Mammoth Wins, Eye of Egypt and Cashed Up which will all be designated tournament games during this month's tournament series. Weekly Faces of Freedom freeroll slots tournaments will award $500 cash prizes to the top scorer on the designated tournament game for the week. The series begins with a $500 freeroll played on Crystal Ball, a mystical game that has a Win-Win feature guaranteeing wins up to 200X during free spins. Players have until July 11th to achieve the winning score. The next week-long tournament will be played on the Mammoth Wins slot with its Ice Age cartoon characters and Free Spins feature that awards up to 33 spins with 3X multiplier. Tournaments played on Eye of Egypt and Cashed Up complete the series later in the month. To claim a “staggered” bonus the previous week’s bonus must first have been redeemed. All casino bonus coupon codes are valid until August 4th.